There are many ways to customize and integrate with/to SharePoint 2007 (MOSS). With the migration of Microsoft Content Management System (MCMS) into SharePoint, the ability to create a publishing page using a template can allow non-technical users to create some dynamic-looking & functioning collaborative-ly created web sites. While it is super-easy for content authors to add and update pages within the website, there is also the ability to do so via the SharePoint API. This means that existing solutions and application within the enterprise won’t need to move any “data” to the SharePoint environment, nor should they. Instead, the office user would simply check a box in the WebApp (or other system UI), or click a button to have the details available online. Of course, this could then show in whichever page layout (template) format as desired, complete with CSS and HTML layout, etc – and only the fields needing to be published (by the application/web service). You could then configure “search” functionality within SharePoint – and you have a searchable online website, driven from a existing core business system. I’m working with Visual Studio 2005 (could use 2008 instead) on a VM that has SharePoint installed, and the full developer tools – it’s best way to get a working developer environment. 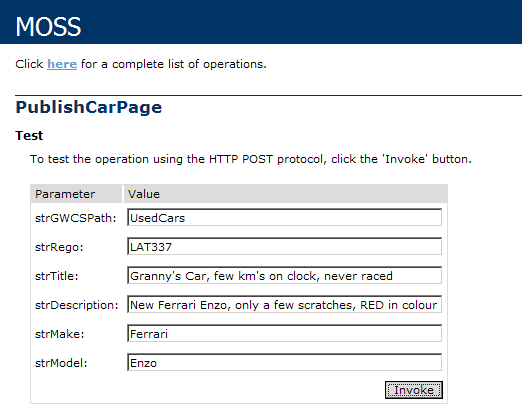 In my example, the class/web service is called GWCS – Grumpy Wookie Car Sales – could then use something like a C# Windows App used to push listings of new & used cars, including photos (eventually). As the interface to the web service, I’m using some hard-coded input variables, rather than a class library – which would be much nicer if you need more than 1/2 dozen inputs. 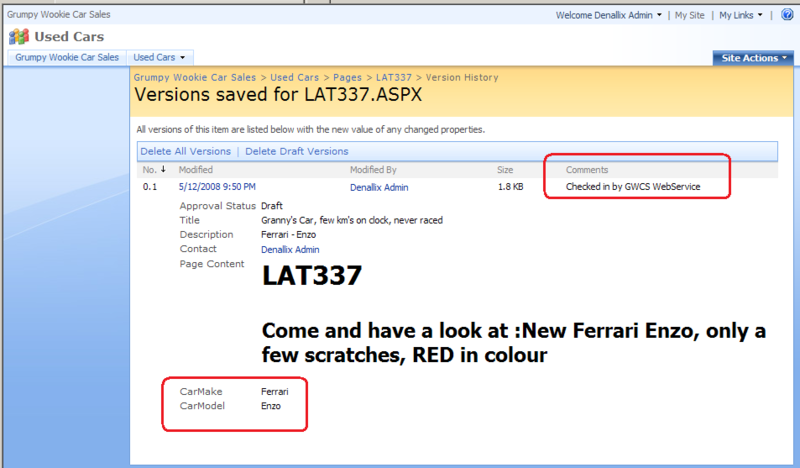 Just need to create a reference to the “site” initially – this is the specific site collection that you would have created in Central Admin – in my case, it’s my Car Sales site on the internal “Wookie-Sell-It.com” server. Next up, open the “site” within the site collection. This would be for any nested sites, or “children” sites – depending on your corporate terminology. I’m opening the “UsedCars” site, for GWCS – there is also a “NewCars”, “Trucks”, etc. Can use some business logic to put in different “folders” – and thus could have different master pages, page layouts, and search function – for example. Otherwise, it doesn’t exist – so we need to create it. There are a bunch of Page Layout “types” from the SharePoint gallery – take your pick ! Or – can use a custom Page Layout (most likely). All that’s left – is to fill in the content ! Fields, images, whatever – as it’s a Page Layout specified “graphically” by a web designer, it’s just fill in the gaps (properties). And some custom properties – these were added as Site Columns, but a better approach would be to add to Content Type – then assign it to the Pages Library you’re using. And – set to update the “page” object, does some more stuff above & beyond the listitem update. And then Check-In – and it’ll appear on the website. The user account that the web service is “running as” must have some HIGH level privileges for this to work – basically, as much as the MOSS user account. I created a new web app, and set the same AppPool as for SharePoint. I was finally able to get it work after turning off “security validation” for the website, as detailed by SpiderWool. UPDATE : Click here to view the full code sample.